First and foremost, Donald Trump has succeeded in providing cover for every politician, celebrity and billionaire who gets caught doing something unseemly. And if 'The Leader of the Free World's' peccadilloes were not enough, the behavior of other tech luminaries like Elon Musk have changed the public's - and the investing world's - notions of what is acceptable, or at least tolerable. Jeffrey P. Bezos’s explicit selfies and public attack on the National Enquirer make him part of the club of technology executives behaving badly. But his troubles aren’t likely to roil Amazon — at least for now. On Thursday afternoon, Bezos posted a lengthy letter on the blogging platform Medium in which he accused the Enquirer of trying to blackmail him by threatening to publish intimate details about his extramarital affair with former TV anchor Lauren Sanchez. The letter — which included intimations about the Enquirer’s parent company’s relationship with the Saudi government and with President Trump — sent shock waves through the business world and across Washington, escalating a drama that had previously been confined to the tabloids. 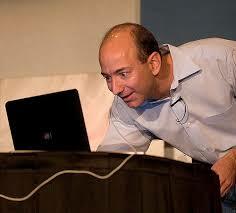 But the news didn’t appear to harm Amazon’s stock price. It was down roughly 2 percent Friday, a dip that largely mirrored the movement of the broader market. Last week — while Bezos’s personal life was already embroiled in controversy — the company posted a record profit for the third quarter in a row. Overall, the stock has fallen 5 percent since the Amazon founder announced on Jan. 9 that he and his wife, MacKenzie, would divorce. “I bet he feels quite gratified,” Sonnenfeld added. Bezos’ behavior differs from that of other prominent tech executives that has caused trouble for their companies, Sonnenfeld said. Tesla’s Elon Musk smoked marijuana during a media interview, and he separately made a sudden announcement on Twitter about taking his company private, which led to a punitive action by federal authorities. Uber co-founder Travis Kalanick fostered an anything-goes environment where sexual harassment proliferated, while other rule breaking put Uber in the crosshairs of local authorities. Kalanick also lashed out at an Uber driver on video. Still, other experts pointed out that if the fight between Bezos and the National Enquirer drags on, either legally or in the court of public opinion, it will become a distraction for the Amazon founder. “For a sitting CEO of a public company, it wasn’t the wisest move,” said Charles Elson, director of the John L. Weinberg Center for Corporate Governance at the University of Delaware. “By taking that step, you only call more attention to the allegations. It was a mistake, and Pecker will come back at him, and it will come to occupy a significant amount of his time,” he said, referring to National Enquirer publisher David Pecker. Reaction among some Amazon employees has also been telling. Bezos’s blog post was quickly republished across the company’s many internal corporate chat rooms shortly after it came out, according to two employees who spoke on the condition of anonymity to discuss internal corporate matters. Discussion turned immediately to the potential impact on the stock price. People in Bezos’s orbit appeared unfazed, or they rallied around him. Former Amazon executive Charlie Kindel, who led the company’s Alexa product line until last year, tweeted in an almost jovial manner about the letter. He recirculated a limerick about it along with another tweet by a person who said they couldn’t wait to preorder the book about the feud between his former boss and Pecker. Roger McNamee, a Silicon Valley investor who has worked with Bezos and is a vocal critic of Facebook and Google, said he hoped Bezos’s efforts would help force tabloids and the political establishment to stop using dirty tricks.